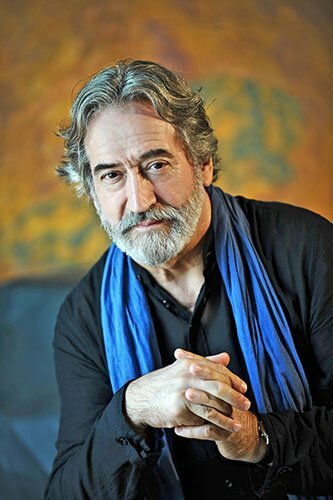 On Friday of this sixth week of the Rockport Chamber Music Festival, Hespèrion XXI, led by the esteemed Jordi Savall, and the Mexican-based Tembembe Ensamble Continuo delivered exhilarating music inspired by the European discovery of the New World. Savall set out to explore the dialog between diverse coastal musical traditions—colonial, creole, African, indigenous—and how contemporary European traditions influenced and were influenced by other cultures. Sailors, soldiers, slaves, priests, and other travelers brought their music with them to new territories, and brought back the tunes and rhythmic patterns they learned from the local peoples, inspiring new music back at home. To illustrate this mixture of influences, the ensembles chose instruments from a variety of traditions, including viola da gamba, theorbo, and baroque guitar from the European tradition; a one hundred year-old Moroccan drum; maracas, claves, and castanets; the marimbol, an instrument that found its origin from both African and Cuban influences; and even a horse jaw. The Shalin Liu Performance Center’s vibrant visual background paired marvelously with the vigor of the music. The ocean’s sparkle in these final moments offered a quiet reminder of the path by which the people, ideas, and music had traveled. The concert opened with Diego Ortiz’s divisions on “La Spagna.” The original tune appeared in the 1400s and was very popular in Europe for over a century, inspiring variations from many composers. Savall’s take on Ortiz’s version began with a simple yet elegant intro on percussion and theorbo, followed by the unadorned tune on viola da gamba and then several rounds of Ortiz’s elaborate divisions (and I suspect, some of Savall’s own improvisation). I was struck immediately by the mastery and presence of the ensemble, which consistently produced music that felt truly alive, and never static—one could almost feel the music itself breathe. The constantly changing dynamics, textures, and intensity invited—but never demanded—constant engagement from the audience. Without prior knowledge, I might not have known that the players were from two distinct ensembles, so natural was their communication and so clear was their enjoyment of each other’s music making. The performance evoked the atmosphere of a sunset party among good friends. Two improvisations on folias (ostinato bass lines) followed the Ortiz, with Savall again as soloist. His improvisational style in these pieces showed influence from contemporary European conventions of ornamentation, with daring ornaments and divisions. The viol variations increased in complexity and speed every time through the harmonic progression, and Savall applied a variety of string techniques—standard bowing, pizzicato, col legno, and ricochet—to bring constant transformation to the sonority of the solo instrument. At times the viol sounded like a fiddle, a guitar, and even pitched percussion. Savallos affect and impetus for each set of divisions inspired the style, texture, and intensity for the rest of the group. The collective improvisatory approach kept the music fresh and exciting, as the audience could tell that music was not simply taken from scores, but actively created by both the soloist and those serving as the foundation of the progression, much like modern jazz practitioners improvising over the twelve-bar blues. Between sets, the performers took a number of pauses to tune. One would think that the air conditioning would reduce the need for such frequent adjustments, but the instruments were given hard use, and keeping consistency between the dozens of strings on stage was no small task. In particular, the tuning between the marimbol and the lower strings of the theorbo had to be perfect, since they both played the notes of the ground bass. The Jácaras, a duet featuring baroque guitar and percussion, was a shining jewel of the first half. Xavier Díaz-Latorre utilized a finger-picking style ancestral to the flamenco tradition, ornamenting with beautiful trills executed almost faster than eye could see but still remained light, spontaneous and relaxed—the mark of a true master. Despite the speed of the execution and the complex rhythm of the percussion, the duet felt subdued and relaxed, and many in the audience could be seen watching with gently bobbing heads. La Petenera was the first work to include singing, a contribution from the members of Tembembe. Their rustic singing style featured a more forward sound and stylistic pitch-bending. The solo singing of Ulises Martínez proved particularly memorable. The pronunciation of the Spanish changed depending on the origin of the song, at times Castilian or Mexican in flavor. As clear as the pronunciation was, I would have loved to have had lyrics and translations printed. After intermission, Savall spoke to the audience and gave some background on his two violas da gamba, which he revealed as historical instruments (not replicas!) which contained only a few modern replacement parts where absolutely necessary. He also spoke about the “bagpipe” tuning he would be using for the next set, which he accomplished by crossing two strings of the viol at the bridge and the nut, which he displayed to the audience. I would have preferred that he had been given a microphone, since his speaking voice was somewhat small for the hall and easily obscured by the slightest audience noise. A trio of Scottish tunes featured Savall on tenor viol and David Mayoral on frame drum, which he employed with a tipper in the style of the bodhrán. The two provided exceptionally passionate versions of the tunes, their rhythmic accents reminiscent of the turning of a great wheel. When the wheel seemed to be spinning its fastest, the drum would join as if inspired by the viol to movement. When the wheel slowed, the drum dropped out, allowing these sections more freedom. At the end of the set, Savall made a great show of uncrossing the crossed strings, producing a chuckle from the audience. Before the final set, Savall led a brief “show and tell” of the different guitars and other plucked string instruments used by the ensemble, as well as the marimbol. Each briefly demonstrated its specific timbre. At the close the audience leapt to its feet in a near-instant ovation. The concert had already run over two hours, yet cries of “otra más!” came from many in the crowd. For an encore, the group gave Tonada del Chimo (#180) and Cachua Serranita (#192). The Tonada del Chimo, a funeral march, was the most stately composition offered, yet still breathed just as easily as the rest of the program, if a bit slower. The Moroccan drum was a fixture in this piece, which seemed more reminiscent of the living left behind than of the departed. The Cachua Serranita felt considerably more lively, featuring frequent duets between the treble viol and violin, as well as a variety of percussion including the horse jaw seen earlier. With degrees from Ithaca College and Longy, Teri Kowiak is a professional singer and voice teacher specializing in early music. She is founder and director of the medieval ensemble Meravelha. We heard the same program at Ozawa Hall at Tanglewood last Thursday. Unfortunately, Savall did not talk about the instruments during that concert, and many among the audience would have welcomed that information, as much of the chat outside the hall was about what they were seeing and hearing and what the less familiar instruments were. Nevertheless, this is an extraordinary collection of musicians and a wonderful program.